Overall, Fox FM is now the most listened to commercial station in Melbourne with 10.4% of audience share, followed by TripleM with 8.4%. 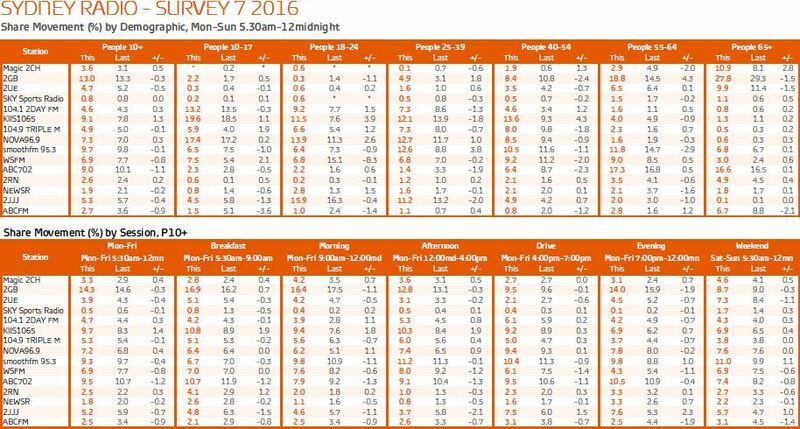 Fox FM pushed Gold into second place, after both tied with 8.6% in survey six. Hamish & Andy have now also opened up a sizable gap to again reign supreme in Melbourne drive time commercial radio. The pair gained 2.3 points to a 13.3% audience share, which is now a 5.5 point lead over nearest FM rival Nova's Kate, Tim and Marty on 7.8%. Triple M is in third spot with a 7.6% share. Hamish & Andy have also overtaken 3AW's Tom Elliot on the AM band, who gained 0.2 points to a 12.1% share. Elliot still comfortably leads the AM band from the ABC, which lost 0.5 points to 8% share. On breakfast, Triple M's Eddie, Mick and Luke have surged ahead in FM ratings, gaining 0.7 points to 9.9% share of the Melbourne radio audience. They have opened up a 1.4 point gap on SCA stalemates Fifi, Dave and Fev on Fox FM, who also increased 0.5 points. There's then a 1.5 points gap to Nova 100's Chrissy, Sam and Browny. On AM, 3AW's Ross and John dominate with a 17.8% share, despite shedding 0.9 points. ABC dropped 0.5 points to 12.3% although its FM stablemate Triple J gained 0.4 points to 4%. In the penultimate 2016 radio ratings survey when looking at the leading commercial stations, Australian Radio Network's (ARN) Kyle and Jackie O's FM breakfast show continued to hold the top spot in Sydney, and gained an extra 1.3% share, taking it to an overall breakfast radio share of 10.8%. ARN's WSFM stablemates Brendan Jones and Amanda Keller held second spot with 7% share. Kyle and Jackie O remain well ahead of its breakfast rivals with Smooth FM'S Bogart Torelli and Glenn Daniel sitting at 6.7% and Nova 96.9's Fitzy & Wippa sitting flat with a 6.4% share. Despite rising from a 4.1% audience share to a 4.3% stake in survey six, Southern Cross Austereo's (SCA) 2DayFM show with Rove and Sam has dropped slightly to 4.2% in this ratings period. Commercial stations aside, looking at who ruled the overall breakfast slot, 2GB's Alan Jones remains top of the pops with with a 16.9% audience share. Jones saw an increase of 0.7 percentage points in survey seven. Second spot again goes to ABC 702 which pulled a 10.7% share. When it comes to the overall total listening across Sydney, survey seven again has 2GB's Alan Jones scooping the most listeners overall, with 13% of the total audience. This marks the talkback radio station's100th radio survey win. Nova's Smooth FM is again in second position overall, but first in the FM stakes, with a 9.7% share. In third spot Kiis 106.5 has knocked ABC 702 off its spot, winning a 9.1% share – up 1.3 percentage points overall. ABC 702 came in with a 9.0% share. 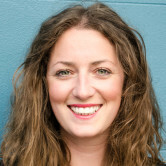 When it comes to the prime time drive slot Nova's Smooth FM has managed to retain the number one slot in drive in Sydney, but it has decreased its share by 0.9 percentage points. It now has a total drive time share of 10.4%. 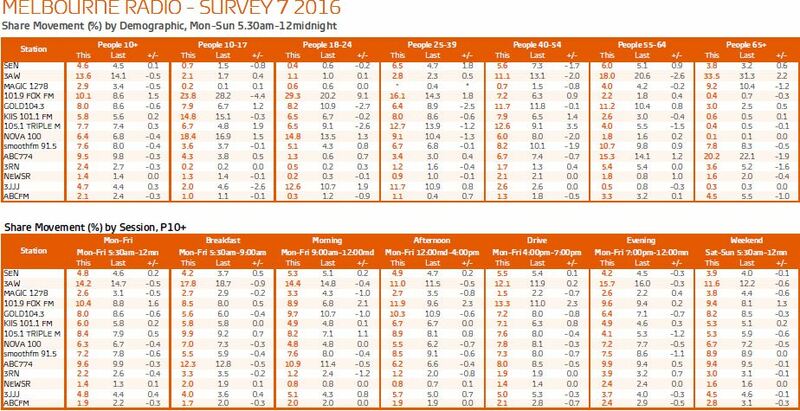 ABC 702 and 2GB both sit at joint second position with a 9.5% share. Nova's Kate, Tim & Marty show was again the fourth most listened to show in drive time with a 9.4% share, having increased its listeners by 0.1 percentage points. However, Kiis' Hughsey & Kate are now snapping at its heels as the duo, while in fifth position, have increased from 8.9% to 9.2%.